I was talking with some people earlier this year about figuring out a business birthday. I mean, we all know our birthdays but what day did you start your business? If you open a storefront (or say a coworking space), that date is pretty straightforward (i.e. when you opened to the public). If you have a service-based business (or really any business you’ve started part-time), it’s a little more nuanced. Is it when you started the concept (launched the website, Facebook page, or whatever you’re “I’m really doing this thing” moment was)? Is it when you got your first paying customer? Is it when you quit your job to focus on the business full-time? For me and others like me, those questions have three different answers. The Breaking Even blog launched October 14, 2007. (If you want to go in the blog archives and look up that first cringe-worthy post, feel free). 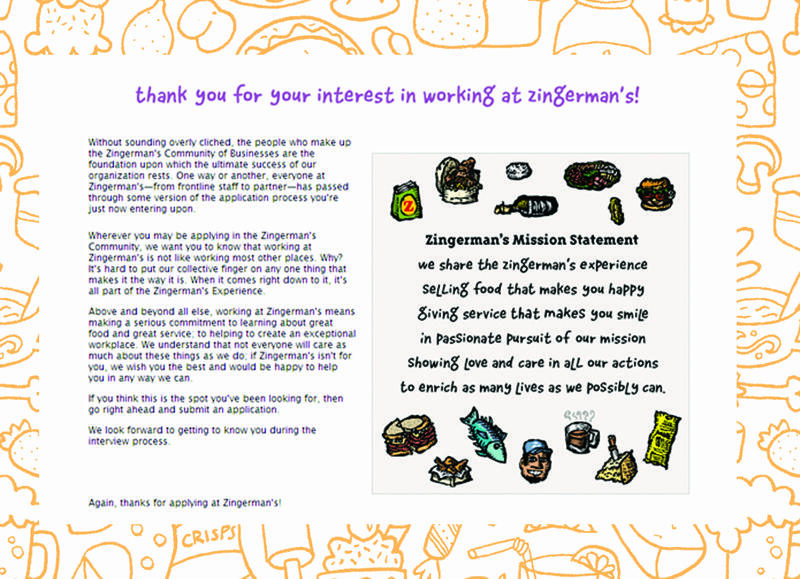 My first paying customer was in January of 2008 (I could probably go back in my old email archives and find the exact date). And I quit my full time job April 22, 2009. (Please appreciate that until I wrote this blog post and looked it up, I thought this was 2008). The truth is somewhere in the middle. So I called it an even ten years this April (which also happened to line up with my 37th birthday and Anchorspace’s 3rd birthday). It feels the most true, so it is. Apparently 30% of American businesses survive ten years. So getting here is a really big deal to me. I’m not going to pretend I did this all myself. Most of us who have gotten here have access to some money. Between family willing to help during rough patches, having a line of credit at my local bank, having the ability to work part-time jobs to generate cash when needed, and graduating debt free from college thanks to my parents, I started a business at 27 because I had access to resources a lot of people don’t have access to. And don’t you think for a second I forget it. Now could I have made different decisions and used these resources for something different? Could I have said “meh I don’t want to work this hard” and just closed the business at multiple points? Of course. I made some decisions that got me here. I also want to acknowledge I am fortunate and have tried to use this opportunity not just for myself, but to make an impact on others too (clients, employees, my community, etc.). Does this mean you can’t do it without cash? Of course not, but you might need to do your thing part-time for a couple years to save up your nest egg or make other sacrifices. And that’s ok, so long as you know this is a marathon and not a sprint, it’s all figureoutable. Networks work in two directions. I grew up in a small business household and my parents taught me business was about service, hard work, and taking care of your employees (versus getting to do whatever you want, whenever you want). My first client asked if she could pay me to help her (thanks Leslie Harlow). My friend Jen Litteral introduced me to someone at a cocktail party that turned into my biggest client that year. My first customers like Meg Ashur and Michael Goldman took a chance on my new company and told people about me. I was welcomed into various groups like our local Rotary Club, giving me speaking opportunities to reach new people. A lot of people got me here and to pretend otherwise does a disservice to them and me. Now I’m in a position to help others out and I want to be as generous as others were to me. Bootstrapping will get you far, and creative thinking will get you the rest of the way. This mantra has saved me: only buy crap when you need it. Could I have opened Anchorspace with fancier amenities and really wowed the people at our open house? I’m sure. But waiting until someone said ‘hey, can we get a paper shredder’ and ‘how about a white noise machine for outside the conference room?’ (and clearly creating an environment where people feel like they can say what they need!) has saved me thousands of dollars. Also, asking people for specific stuff really helps. A good friend now, I was just getting to know local resident Brenda Beckett when she gave a coffee maker, end tables, stainless steel dish rack, and other supplies for Anchorspace that would have cost us hundreds of dollars. At the same time, it is worth investing in certain things–don’t be a cheapskate. If you do need something you consider expensive, get creative. Can you rent it out? Can you share the expense with someone? Will it get you new clients to recoup the cost? Will it free up your time for more billable work? Don’t be afraid to spend money; just do it with some thought. Take care of your employees and don’t think they owe you. Because this is my business, I should be working harder than everyone else. Hiring an employee is an investment, but they are also a person. If there is ever a fight between a client and an employee here, I will usually take our employee’s side, which helps foster a positive work environment where people feel supported. I want my employees feel like they can take chances and not get yelled out if they make a mistake. I like to say ‘if you see something, say something’ and I can’t tell you how many times someone else’s eyeballs have caught things I didn’t because we have that kind of company culture. I am not the be all end all, thankfully! I hire for personal qualities (honesty, integrity, intelligence, good attitude) and train on the rest. No employee owes me anything besides an honest day’s work and treating me, and everyone else they interact with, with respect. Be with someone who understands the time and effort you have to put in, or be alone. I’ve been single and living alone most of these last ten years. I can have a protein shake for dinner and pull an all-nighter without someone telling me how boring I am. I can’t say this cost me anything in terms of personal relationships because honestly I don’t really know what I would be like if I had a normal 9-5 job. I do know I needed to put that time in to be successful… and there’ll be times I’ll have to work even harder to realize new goals. I’ve always hoped I’d share my life with someone who understood my passions. I like to end a day feeling like I’ve left it all on the field so to speak, where I did my best for everyone including myself… and it takes a special kind of man to not only understand that, but also admire it. I have had both partners who worked against me and partners who were supportive–it is the difference between running a marathon on a well-maintained trail and running a marathon on beach sand. My tolerance for risk keeps getting higher as I get older. Losing my father suddenly when I was 27, getting divorced at 35, and having a few other crappy, somewhat out of my control things happen (dog deaths, moves, health scares, etc.) makes me know time is short and while I’m alive, I should do as much as I can. I’m not going to have children so part of the legacy I’ll leave behind is my work and the impact that work has on others. Thinking about that legacy with a bit more intention the next ten years (and increasingly working smarter) are my new goals, which means taking bigger chances. Opening new locations, hiring more people, going after bigger projects means more financial risk. But as I see from failing that I didn’t die from it (or hurt anyone else), it’s made me open to making bigger decisions more easily (and creating new problems/risks for myself). You can always make more money and when you realize no one is going to die if you don’t close the $100,000 contract, it makes you realize you can at least risk it! So you might be reading this thinking you might want to be self employed. What do I think it takes? If you remember the feeling (back when you were in school) of it being Sunday night and you haven’t done your homework… and you can live with that nervous feeling in the pit of your stomach the rest of your life, you can handle running a business. If you’re kind of good at a lot of things, business ownership is a great way to make yourself instantly diversify as efficiently as possible. If you go into starting a business knowing it’s the opposite of being all about you, you’ll be able to survive by serving your employees, customers, and community. But you also need luck, a nest egg, friends, and some other things that are not entirely in your control. Because the reality is, you might fail–even despite having all the right personal qualities and other factors in your favor. I hate to break it to you but you might ‘fail’ at other things too. If you get married, you might get divorced. If you quit your job, you might hate your new job. If you move to a new town, you might not like it. Anything big feels scary and fun and emotional and interesting and weird and irreplaceable. This gamble of owning a business just happened to work out for me… and I happen to have some of the right qualities to have helped it work out. Nothing more and nothing less. Thanks for being a part of the story. Because ten years doing anything is significant. And it makes me wonder what it’ll be like twenty years from now because at least from all this, now I know I could make it that far. It seems harmless: why not ‘boost’ that Facebook post for $5? But I’m here to tell you that not only is this a potential giant waste of money but of your time and effort. The exercise I am going to propose you do is a complete buzz kill but I’ll do it with you to show you how important it is. 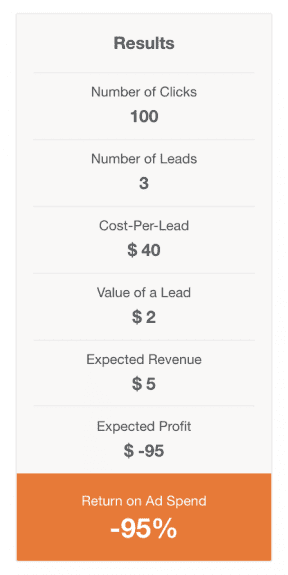 I think it’s important to think of the following numbers related to your business. Of the roughly 3,000 people going to the site I’ve tracked, we’ve gotten 55 orders. So that’s a 1.8% conversion. Clearly I have some kind of budget per month (let’s say for round numbers $100) but I clearly don’t want to pay more for an ad than I am making so let’s say I’m willing to pay $1/click as a maximum bid. It doesn’t take a genius to see that to buy Facebook ads, I am losing money. Which is why for this site I don’t. And what’s great about the calculator thing is you can adjust certain variables. Like what if I lower the amount I’m willing to pay for a click to $0.50 instead of $1? Wohoo, I’m losing less money! What if I made $5 per order instead of $2? What if I increased the conversion rate on my website (ie made sure more of our website visitors bought something)? I can see what changes actually move the needle and adjust my website and marketing strategy accordingly. I did this exercise with a potential client and she was totally deflated. 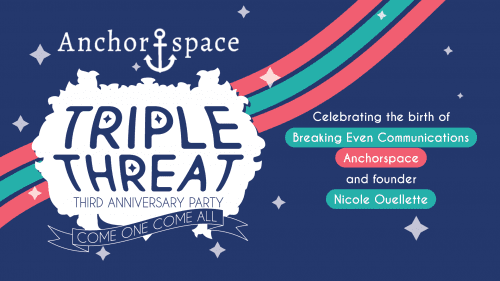 She had been holding these low cost events (not unlike our $25/person workshops at Anchorspace) and wanted to advertise them… but with the exercise understood taking out ads would cost her more money than she’d make. Now I could tell she loved the events so I didn’t tell her to not do the events. And I didn’t tell her not to advertise. What I did tell her is if she was going to keep doing her events, she’d have to stop looking at them as a moneymaker and instead think of them as a loss leader (getting people into her business where they buy other things) or marketing tool (something to get her name out there, regardless of whether people came or not). In other words, not everything you advertise has to make you money directly. But if it’s not making you money, you should have some other reason to do it that makes sense. Facebook Ads can be a great tool but I see so much wasted effort. By knowing your numbers, using a Facebook calculator, and having your non-revenue generating activities have another clear purpose, you will be spending your money and time more purposefully and effectively going forward. 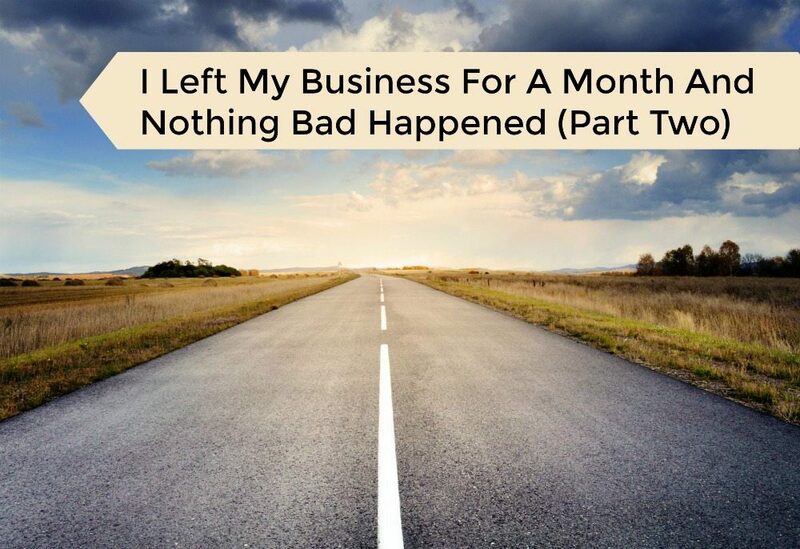 Last week, in “I Left My Business for A Month and Nothing Bad Happened Part 1” I talked about keeping the businesses running while I was physically in another place. This week, I’ll talk about the other side of the coin- getting involved in a new market. Ten years in the same location, especially in a small town, is almost the definition of “comfort zone.” Sure, we’ve grown and challenged ourselves so that our business isn’t frozen in time, but the time to innovate is always now, and travelling to upstate New York was part of that process. While I was in a new location, I needed to set myself up to meet people. Something most people find surprising about me is that I’m an extroverted introvert, which means talking to people requires energy from me and I almost never want to do it. Once I AM doing it, I’m fine, but afterwards I definitely need to spend some time alone to regroup. Meet with the local SBDC with your theoretical new additional location business plan and some questions ready to go. Connect with any local business incubators and be in their space if at all possible. Set up a short meeting with people who work there to let them know what you’re doing and how you could help. Connect with the local library and offer a workshop. We did a free workshop and gave a donation to the local SPCA, which meant that the library promoted it because the workshop was in their space, and the SPCA promoted it, too. Check out local meetups and attend to meet new people. I attended a local artist group and we got to tour this cool museum and people shared their work. Go to the local happy hour spot by yourself and sit near some nice people. Join local Facebook groups. (My LOL moment was when I joined the ‘Potsdam Rocks’ Facebook group, thinking it was going to be about community development but then upon acceptance, found out it was about… painted rocks.) Ask local friends recommendations for good groups to join. Ask every person you meet who else you should meet. Use Facebook or LinkedIn to find contact information and name drop your mutual connection, offer beer/coffee, or otherwise see if you can meet these people in real life. Meet with local economic development directors or city planners and ask them questions about the community and how you can best provide business services. Go to a local Rotary club meeting (and any other civic groups you can find). Attended a meeting for volunteers at the local dog park (which my dog loved). trying to bring value to any interaction I had. I figured if I didn’t know someone and they were taking their time to help me, the least I could do was give them some free consulting and/or food. Because I made the leap, I am now in talks for two good size proposals I would not be having the chance to do otherwise. I also had time/mental space to finish some big projects (like adding a learning management system to Anchorspace’s website and creating an online store of the cool designs we commissioned from graphic designer Jill Lee on Society 6.) I even brainstormed an idea for an e-course about running a business while depressed. I am not sure if I would have gotten some of this stuff done, or had some creative ideas, if I didn’t do a reset outside my workspace. So the results of my experiment are seeing that not only could I run a multi-location company in the short term, but I could use the new location as an advantage not just for myself personally but for business as well. I’ve seen many of my successful business role models run businesses in multiple locations and I don’t see why I can’t be one of them in my next decade. I will also say as a total plug, upstate New York has some of the nicest most welcoming people I’ve ever met. I was surprised to make some real friends during my month long stay. And I hope as I broaden my scope, my two hometowns will support the work we are trying to do and grow. And, if you’re new to the area (or ANY area, really), the steps I took in New York to start meeting new people and connecting with the community are worth trying for yourself. They’re great for making both business and social connections that will last for years (at least 10 🙂 ).